This was just the type of book that got me reading in the first place. From page one, I was charmed by Tee and her family. The more characters that showed up, the more I was swept up in all the places they were coming from, and going to. I was glad to be able to remind myself more than once that there are more books in the series. Tee is young enough to need guidance, and an occasional well-timed rescue, while old enough to find plenty of interesting messes to get entangled in. Her curiosity and overconfidence may lead to real trouble one day, as more sinister eyes come to focus on her; but for now she is most alive when danger nips at her heels. The mystery and charm of her grandfather are both quite evident, as Klaus comes alive through her bright eyes. It is clear that a much larger story is unfolding in this world. While Tee’s family is a loving one, they cannot keep their secrets much longer. The peace of their happy home is a carefully crafted sanctuary that only barely keeps a warring world at bay. Klaus is unable to keep his genius and his presence a secret, especially when it could help others; but his entire family could be at risk if he is found out. While he struggles with indecision, along comes a wolf to snap him from his comfortable reverie. This introduction to the world and the story is a touching and heartfelt adventure, what a smart child might observe in an often decidedly tumultuous adult world. Symbology and clever surprises abound in this book, just the kind of dork fare I love to eat up. The story is great without it, or would be; the characters come alive the moment they are introduced, and could carry the tale on their own strength. With the extra layer woven in, this stands out as a great book. It hints at much more to come in the sequels, while standing on its own quite nicely. 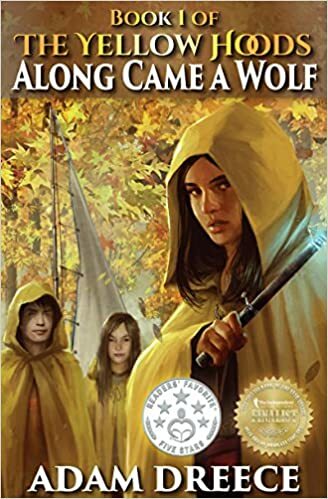 Along Came A Wolf is a perfect example of an all-ages read. Dreece has crafted a tale with elements to delight the child in all of us, and intrigue the most creative adult mind. With just enough detail to put a clear picture in your head, and without overburdening the reader with a long train of the thought that obviously went into building this world, he turns complex ideas into simple descriptions we can all easily grasp. I look forward to seeing where he takes the story as more layers unfold. If I had gotten ahold of this book when I was Tee’s age, I would have gobbled it up like she does her adventure. I would not have appreciated the quiet friendly voice telling the story, or noticed the subtle surprises that my bookish brain delighted in time and again, however. This is a great book for anyone who enjoys a well-told story. Want to grab a copy of this book for yourself? You’ll find Along Came a Wolf at Amazon – click here. Thank you so much not just for the review, but a really well written one.